Today, I participated in a telephone press conference on the Department of Energy Loan Programs Office and a proposed Clean Energy Deployment Administration. They are similar, in that they both are tasked with using taxpayer money to subsidize financing for “clean” energy sources. Each is intended to function like a green bank. My colleagues on the call were: Ryan Alexander, President of Taxpayers for Common Sense; Henry Sokolski, Executive Director of the Nonproliferation Policy Education Center; Andrew Moylan, Vice President for Government Affairs at the National Taxpayers Union; and Jack Spencer, Research Fellow at the Heritage Foundation. Here’s the attendant press release, with a link to audio from the press conference; here’s a coalition letter we (and others) signed to urge the Congress to shelve the proposed Clean Energy Deployment Administration, which is under consideration in the Senate Energy and Natural Resources Committee. Below are my introductory remarks. I’m going to explain very briefly the false impetus behind the Clean Energy Deployment Administration, a.k.a. the green bank, and then I’m going to explain how the historical record suggests that a green bank is certain to fail. Proponents argue that a green bank is warranted to close the so-called “commercialization gap.” According to this line of thinking, venture capitalists fund high risk/low cost projects, while institutional capital funds low risk/high cost projects. Alas, clean energy is high risk/high cost, so it is spurned by both venture capitalists and institutional capital. So I don’t think there’s a real impetus for this green bank. Yet I also maintain that this green bank is doomed to failure, were it to be created. 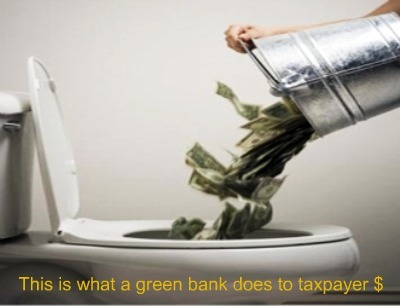 For starters, the government has been running a green bank—the Department of Energy’s Loan Programs Office—for years, and it’s done a pretty awful job, according to the federal watchdogs. In a 2007 report, the Government Accountability Office questioned, “whether this program and its financial risks will be well managed.” A year later, another GAO report said that the “Department of Energy [DOE] is not well positioned to manage the Loan Guarantee Program effectively and maintain accountability.” In the summer of 2010, the GAO faulted the DOE for being too rash. In particular, it noted that the DOE had issued 50 % of conditional loan guarantees before full reviews were conducted. Last March, the DOE’s Office of the Inspector General published a report finding that the green bank program “could not always readily demonstrate, through systematically organized records, including contemporaneous notes, how it resolved or mitigated relevant risks prior to initiating loan guarantees.” According to the report, 15 loan guarantees (out of 18 total) lacked “pivotal” information regarding risk ratings. Political meddling is the fundamental reason that a green bank is doomed to fail. While it would be nice to think that this financial institution would be run by disinterested civil servants, the record suggests that political considerations are all too often a factor. For example, ABC News and iWatch News have reported on the uncomfortable correlation between an applicant’s success in getting a loan guarantees and campaign contributions to President Barack Obama. These sort of political handouts invite Congressional shakedowns. Last February during a Senate Energy and Natural Resource Committee hearing, Minnesota Sen. Al Franken basically told the director of the DOE’s Loan Program to give favorable treatment to a Minnesota based window manufacturer. Most recently, there was the Chrysler buyback, which was facilitated by a direct loan from the DOE’s Advanced Technology Vehicle Manufacturer program, which is run out of the Loan Programs Office. Needless to say, political considerations are conducive to bad investments. In sum, we as a nation are deep in the red. If these loans are too risky for banks, then they should be too risky for American taxpayers. This technology is the only fast green solution! The US government has been working on this technology for over 10 years. Please take 15 min and explore the links provided. Why the US media is reluctant to cover this is astounding. Rossi has announced a 1MW Cold Fusion facility to be opened in Greece this Oct. Still top line periodicals have yet to publish even one article. This will change the economics of the world lifting many people out of poverty and it will also threaten many vested interests. “..Ampenergo was founded by Karl Norwood, Richard Noceti, Robert Gentile and Craig Cassarino. It is important to note that Robert Gentile was the Assistant Secretary of Energy for Fossil Energy at the U.S. Department of Energy (DOE) during the early 1990’s. This helps confirm Rossi’s claim that tests of the E-Cat have been observed by the U.S. Department of Defense and the DOE. It is very likely that at least certain individuals in the DOD and DOE are aware and interested in the Energy Catalyzer. However, their silence is deafening.